We seem to have some uninvited, though not necessarily unwelcome, guests taking up residence in the outside wall of La Petite Maison. We noticed a couple of bees buzzing around the house yesterday, and on closer inspection they were busily flying in and out of these little holes in the south-facing end wall. I assume that the holes must have been drilled to fix something to the wall in the past, but they are now clearly very attractive to these bees. We think that they are red mason bees, but we’re happy to be corrected if anyone knows better! 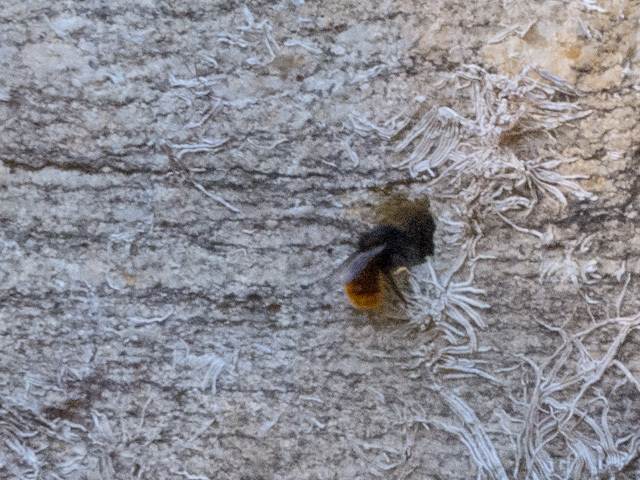 In any case, they are obviously solitary bees, which are not aggressive, and do not swarm, so they are very welcome to make their homes in our wall. Hopefully they will repay us by pollinating our flowers, fruit and vegetables throughout the spring and summer. Those poor creatures need all the help they can get. Glad they’ve found a welcome home in your walls! It’s very interesting to watch their comings and goings. How wonderful to have bees living in your wall. We have a wooden house but have leaf cutter bees who use the gaps created by the overlap of the planks as nesting sites. I love to see them coming!